to measure relatively low impedances in terms of their effective series resistance and reactance components has been pressing ever since quantitative information regarding antenna characteristics was first desired. 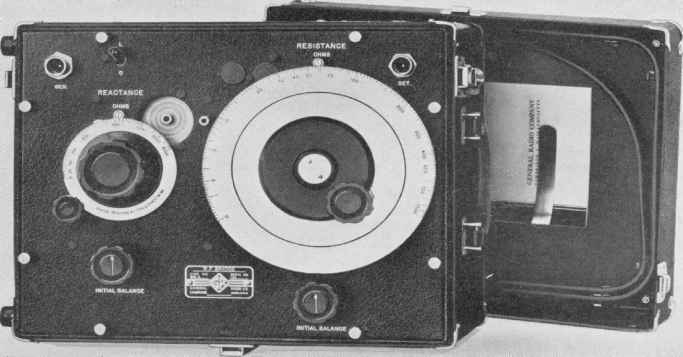 The Type 516 Radio-Frequency Bridge,1'2 first offered for sale in 1932, proved very satisfactory for such measurements at frequencies up to a few megacycles, and therefore found particular use in measurements of radiating systems in the standard broadcast band. 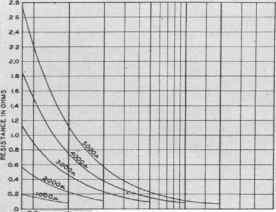 However, as the upper frequency limit at which accurate measurements of impedance are required has increased, the limitations of this early bridge design have become increasingly apparent. Figure 1. Adjusting antenna coupling networks at Radio Station WHDH with the Type 916-A Radio-Frequency Bridge. iciiarles T. Burke, "Bridge Methods for Measurements at Radio Frequencies," General Radio Experimenter, Vol. 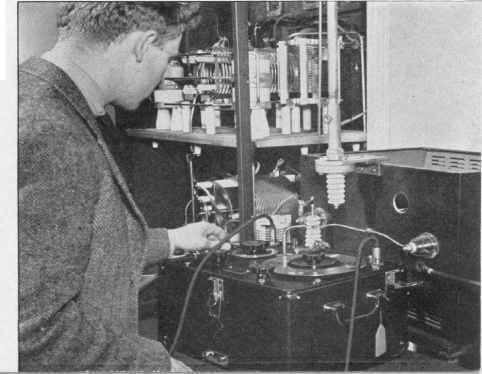 6, p. 1; July, 1932.
itrovemenls in Radio-¡requency Bridge Meth-odsfor Measuring Antennas and Other Impedances," General Radio Experimenter, Vol. 8, p. 1; December, 1933. 3D. B. Sinclair. "A Radio-Frequency Bridge for Impedance Measurements from 400 Kilocycles to 60 Megacycles," Pntc. I.R.E., Vol. 28, p. 497; November, 1940.
convenient form over a wider frequency range. While useful as a general purpose instrument in the laboratory, the new bridge is particularly intended for measurements on radiating systems, and has been designed for maximum convenience in this application. greater direct-reading resistance range, and a simplified dial for reading reactance. The resistance range, from zero to 1000 ohms, is covered 011 a single 8" dial with a scale that is roughly linear from zero to 1 ohm and logarithmic from 1 ohm to 1000 ohms. The resistance-dial read ing is independent of frequency. The reactance range, from zero to 5000 ohms, is covered on a single 4" dial with a scale that is roughly linear from zero to 50 ohms and logarithmic from 50 ohms to 5000 ohms. The reactance-dial reading varies directly with frequency, the engraved scale being direct reading at a frequency of 1 Mc. To achieve these greatly increased frequency and resistance ranges, the new circuit shown in Figure 2 has been developed. Figure 3. Complete circuit diagram of the Type 916-A Radio-Frequency Bridge. 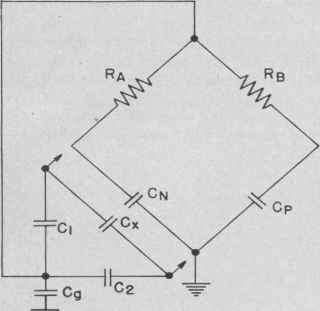 The L-C switch changes the value of the ratio arm Ra* thereby establishing the initial selling of the reactance dial at minimum or maximum for measuring inductive or capacitive reactance. The trimmer capacitances Cjv', Ov" are used to make the capacitance from point "'a" to ground the same for the two positions of the L-C switch. The trimmer capacitance Cn'" is a part of the plug-in transformer assembly and is used to equalize the ground capacitances of the two transformers. in which subscripts 1 refer to initial balance values and subscripts 2 to final balance values. Equations (3) and (4) show that the resistance and reactance balances are independent and that each depends directly upon a change in setting of a variable air condenser. 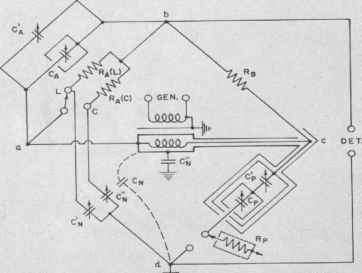 The absence of the cross terms that make the power-factor and capacitance balances interdependent in the Schering bridge results from the fact that the zero capacitance of the condenser Ca is balanced by the resistor Rp rather than by a trimmer capacitance Cb across the ratio arm RB. The fact that the resistance component is measured in terms of the fixed re sistance, Rb, and variable capacitance, Ca, is vital in establishing the wide frequency range, since these elements can be made with very small residual parameters. They combine, in this circuit, to form the equivalent of a continuously variable resistor having residual reactance much less than any variable resistor currently known. The complete circuit diagram of the bridge in Figure 3 shows the modifications in the basic circuit of Figure 1 necessary to meet the needs of a commercial instrument. The condensers CA' and Cp' are trimmers for setting zero on the resistance and reactance dials when making the initial balance. The two ratio arms, RA(L) and RA(C), and the associated switch are provided so that the reactance dial can be set initially at zero for measuring inductive reactances, or at 5000 olnns for measuring capacitive reactances. Figure 4. Panel view of the bridge. The standard connecting leads supplied with the instrument plug into the jack adjacent to the reactance dial. shown in Figure 4. Immediately below the RESISTANCE dial, at the right, is the INITIAL BALANCE knob eon-trolling the condenser Ca- Immediately below the REACTANCE dial, at the left, is the INITIAL BALANCE knob controlling the condenser Cp'. Immediately above the REACTANCE dial is the L—C switch for measuring inductive and capacitive reactances. The jack to which the unknown impedance connects is mounted in the center of the circular window above and to the right of the REACTANCE dial. A connecting lead, with a probe that plugs into this jack and that houses resistor lip, is used to connect to the unknown impedance. Two of these leads, of different lengths, are supplied with the instrument. While the circuit of Figure 2 is, in general, inherently more suitable for high frequency operation than previously used circuits, the actual characteristics obtained are directly affected by the mechanical and electrical design. Some of the more interesting features are described below. Figure 5. Sectional view of the shielded plug as complete as possible each winding is intliv addition to the slotted assembly comprising capacitances Cp and Cp'. The inner shield localizes the variable stray capacitance of the REACTANCE condenser, Cp, within the shield so that it cannot appear across the INITIAL BALANCE condenser, Cp', and cause interlocking of the settings of the two condensers. The middle shield eliminates any capacitance of the inner shield to ground and substitutes an intershield capacitance across the INITIAL BALANCE condenser. The outer shield eliminates the capacitance of the middle shield to ground and substitutes an intershield capacitance across the secondary of the transformer. The assembly as a whole therefore prevents any capacitance but that of the measurement jack itself from appearing across the measurement terminals, and eliminates any capacitance to ground between the measurement jack and the right-hand corner of the bridge. The capacitance of the outer shield to ground appears across the condenser, Cn, in the lower left-hand bridge arm. Actually the outer box dimensions and the spacing to the panel and cabinet shielding are so chosen that this residual capacitance forms the capacitance, Cm, itself. Two 1:1 plug-in shielded transformers are supplied to cover the frequency ranges from 400 ke to 3 Me and 3 Me to in transformer. To make the shielding idually shielded with copper foil, in hrass tubes. in transformer. To make the shielding idually shielded with copper foil, in hrass tubes. 60 Mc. As shown in Figure 3, double shielding is required to complete the shielding system of the reactance-condenser assembly. The fundamental shielding requirements are that the grounded primary be located within a shield at ground potential and that the ungrounded secondary be located within a shield connected to the left-hand corner of the bridge. The shielding must prevent capacitive coupling between the windings, must be located so that the capacitance between the two shields is small compared with the capacitance to ground of the outer shield of the reactance-condenser assembly, and must not seriously impair the magnetic coupling between the windings. The design that has been found to furnish a satisfactory compromise is shown in Figure 5. The most serious source of trouble in the design of these transformers was found to be the electromotive forces induced in the two split brass tubes used as shields between the primary and secondary. The potential difference taken along a radius between these tubes is practically zero at any point so long as the slots in the two tubes are lined up. If, however, the slots are not immediately opposite, over a sector between the two slots the radial potential difference is approximately equal to the electromotive force induced in a single turn in the magnetic field. Capacitive coupling between the two shields over this sector causes a residual component of voltage to be introduced from the left-hand corner of the bridge to ground. This component can cause very large errors in both resistance and reactance measurements at the higher frequencies. Locating the leads to the windings directly opposite the slots connecting the brass tubes to the coil at the same point, and lining up the slots carefully, makes the error from this source negligible. Rotation of the outer brass tube with respect to the inner, in fact, is used as an adjustment to eliminate it. Figure 6 (right). Effective series resistance of reactance condenser as a function of dial setting and frequency. Figure 7 (below). Correction to l»e applied to resistance dial reading as a function of frequency. A plot of the correction to be made to the RESISTANCE dial reading as a function of frequency is shown in Figure 7. As the frequency is raised, the inductance is seen to reduce progressively the resistance range that can be measured and to establish an upper limit for accurate measurement in the vicinity of 60 Mc. In common with other types of impedance-measuring equipment, the bridge can only measure impedance at its own terminals. The residual impedances of the leads used to connect the unknown impedance to these terminals, however, often causes this impedance to differ from the impedance appearing at the terminals of the device under test. Under some circumstances the difference can be ignored and the measured impedance taken as the impedance of the device under test, including the leads. In most cases, however, the device will not be used with the same leads used to connect it to the measuring instrument and it is necessary to compensate for the effect of these leads to obtain the desired impedance. To insure standard measurement conditions, two connecting leads are supplied, one about 5" long and the other about 27" long, over-all. Approximate capacitance and inductance figures are given in the instruction book and simplified procedures for making the corrections are outlined. The wide frequency range covered by the new bridge permits convenient and accurate direct measurements of low impedances at frequencies extending up through the f-in band to the top of television channel I. Two typical examples of measurements on an antenna and transmission line at frequencies between 2.5 and 60 Mc are shown in Figures 8 and 9. In addition to measurements of impedances that fall within the direct-reading ranges of the bridge, measurements can, of course, be made of higher impedances by indirect methods. The following examples show procedures to be followed in making typical measurements. (a) Measurement of 100 np.f Condenser at 500 Kilocycles. 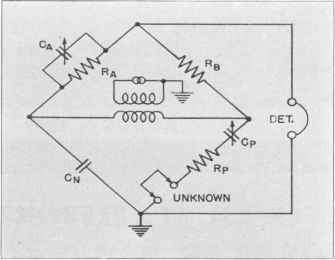 The unknown impedance, in this example, is a small mica condenser of good power factor. Plug short connecting lead (916-P3) into panel jack and fasten one lead of unknown condenser to panel binding post. Adjust location of unknown condenser so that clip of connecting lead can be transferred from ungrounded condenser lead to grounded condenser lead with minimum change in connecting-lead position. Reactance of condenser will he about 3200 ohms (1600-ohm change in dial reading) so balance cannot be made with switch in L position. With switch in C position establish an initial balance. Set the REACTANCE dial at the lowest convenient reading, say 4000 ohms. This example is cited as an extreme case, in which failure to correct for the dielectric loss of the REACTANCE condenser leads to an error in resistance measurement of nearly 30%. For impedances in which the resistance component is larger compared with the reactance component the correction is of less importance. (ft) Measurement of Broadcast Antenna at 1170 Kilocycles. In a typical case, the antenna terminal is located within a metal rack in a small house at the foot of the antenna tower. The bridge can be set up on packing boxes to come up to the front of the rack but cannot be brought close enough to the antenna terminal to use the short connecting lead (916-P3). Plug long connecting lead (916-P4) into panel jack. Ground bridge to rack with short lead, preferably of copper strip 1" or so wide. If this connection cannot be made conveniently to the clamp provided on the instrument case the panel can be loosened and a piece of copper foil slid onto the crack between the panel and the instrument case. Do not ground to panel screws as they may not be making contact to the panel because of paint. Arrange connecting lead so that it can be clipped to antenna terminal or to nearest ground point on rack with as little change in physical location as possible. The lead should be kept as far away from metal objects as possible throughout its length by any convenient means such as suspending it with string. "This quantity is practically equal to the power factor (Kx/Zx) for »mall values, and is often so miscalled. Suppose the antenna to be about 0.6 wavelengths long, with an impedance having a capacitive reactance component. With the toggle switch set to the C position, and the connecting lead grounded to the rack, establish an initial balance. Set the REACTANCE dial to 5000 ohms pending further knowledge of the magnitude of the reactance. How to perform schering of schering bridge?